In this review, we have included our guest reviewer Claire (@writteninrice). She creates and sells pen wraps via her etsy site as well as at the San Francisco pen show. 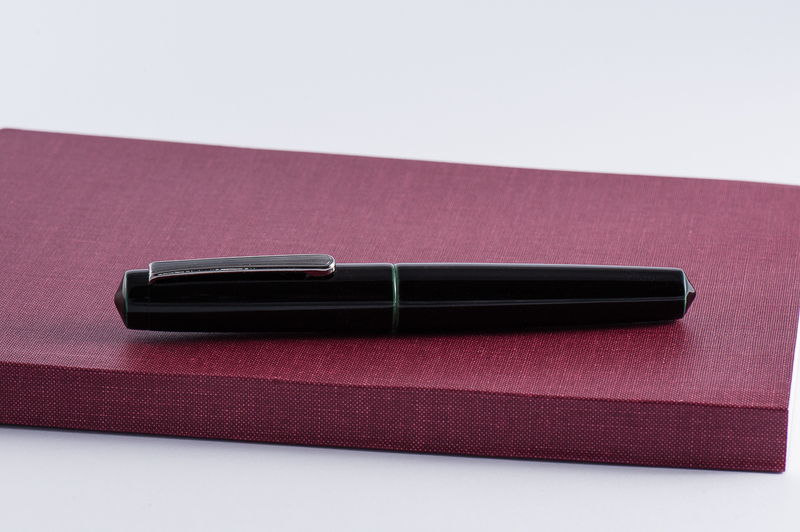 Thanks for joining us in reviewing this Nakaya pen Claire! 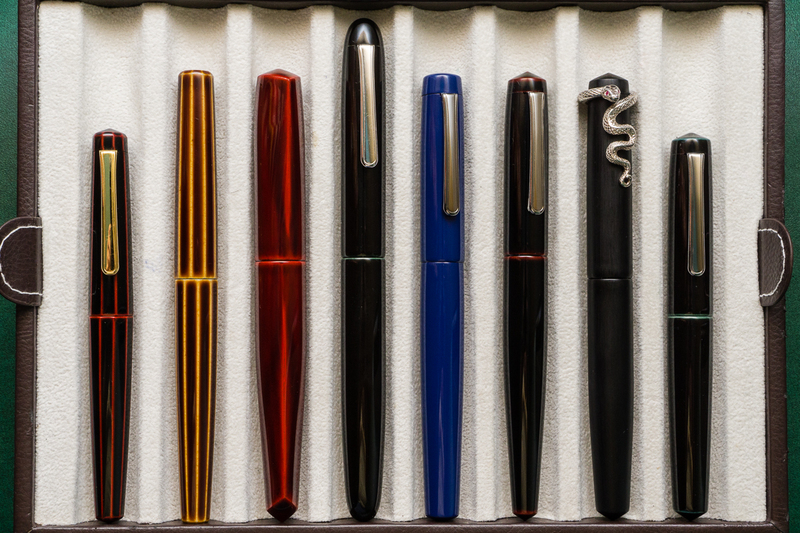 Katherine: The Nakaya Piccolo is one of my favorite shapes — it’s short, lovingly chubby, but also has pointed ends that give it some visual interest. In addition, the two I own are both in Nakaya’s lovely layered tamenuri urushi finishes. 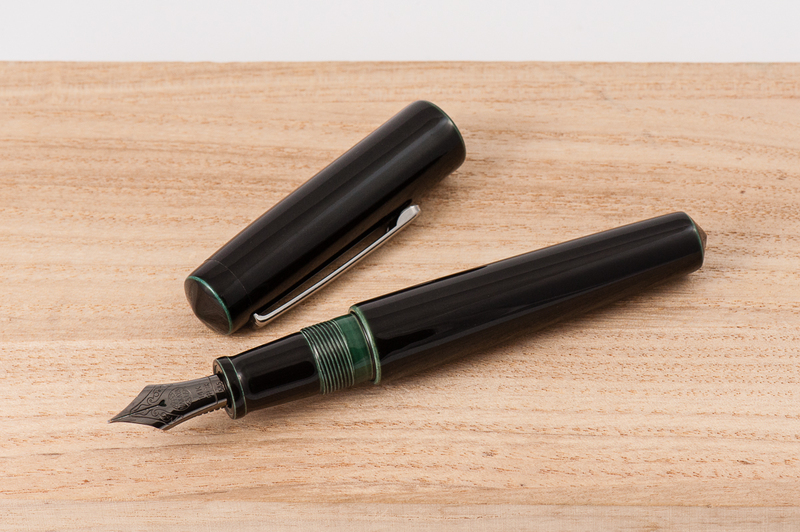 The Ao-tamenuri in the pen pictured is the more subtle of the two — the pen looks black at a quick glance, but upon closer look (or uncapping) there are hints of blue green. Claire: It is hard to beat urushi in terms of beauty and depth. Don’t get me wrong, there are a lot of amazing materials and finishes out there, but as far as I’m concerned, urushi will always take the cake. The Piccolo is the perfect size for my hand. I have found the other Nakaya shapes to be just a little bit too long for my taste and almost feel a little awkward in my hand. 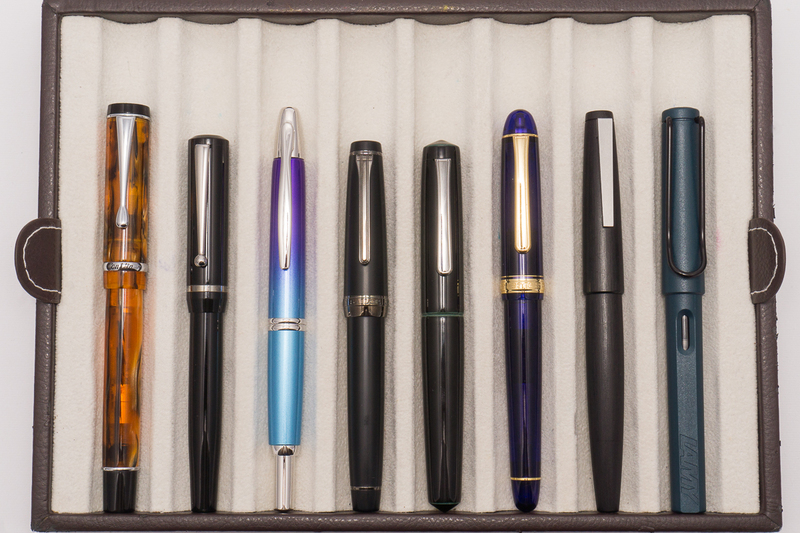 Pam: The Piccolo is a great compact pen that is similar in size to the Pilot Prera and the Sailor Pro Gear Slim, so it would not be surprising that Piccolo is my favorite Nakaya model to hold. (The dorsal fin version 2 is my favorite to behold, if that makes sense.) I greatly appreciate that the shape is not the ubiquitous cigar shape, but rather has tapered ends which is much more streamline in my opinion. 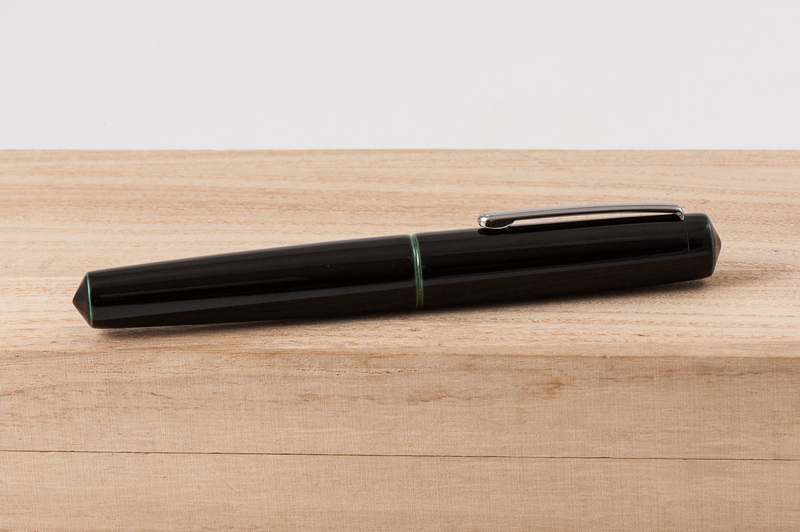 Although I greatly appreciate the craftsmanship of urushi, I am also really intimidated to own a urushi pen. Perhaps the cost plays a role in it, but I am almost afraid to damage the pen or the finish. I am just not in the urushi-comfy zone yet. 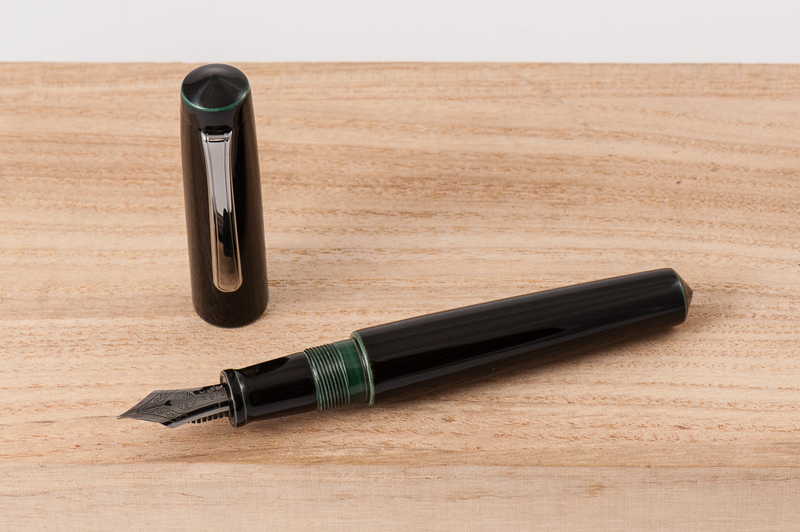 Franz: The Nakaya Piccolo has a very appealing aesthetic. As Katherine “pointed” out, the pointed ends are a nice feature and when you see it, you know that it’s a Piccolo model. Notice that the barrel’s finial is pointier than the cap’s? I really like that detail. And the Ao-tamenuri finish is lovely especially the sliver of color where the cap and barrel meet as well as on the threads. 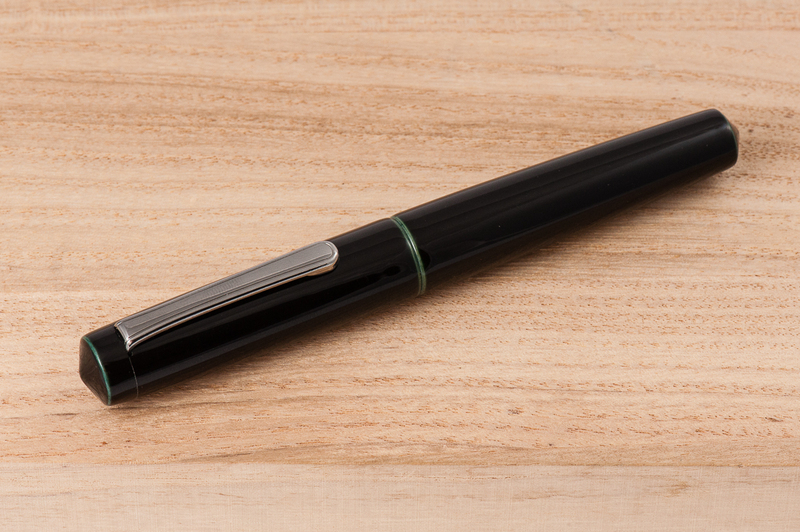 Sadly, it has been a couple years now since Nakaya discontinued the Ao-tamenuri finish. The Piccolo is still available in a variety of colors and finishes though. 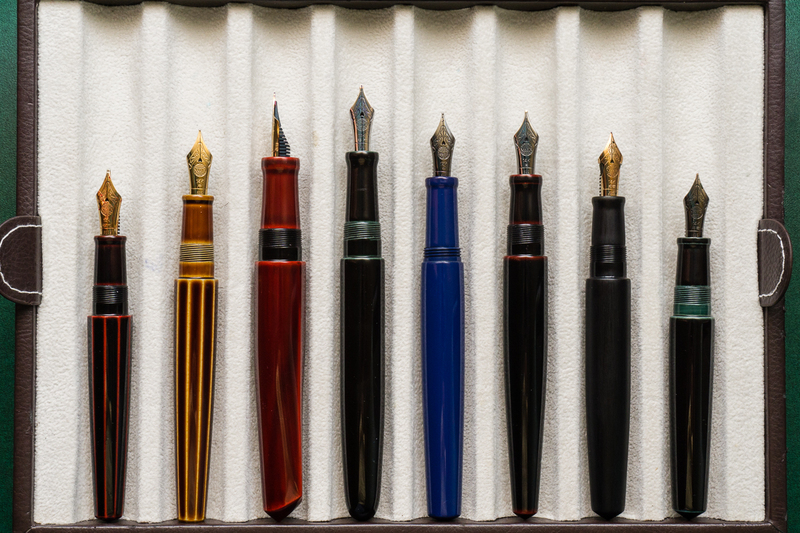 Katherine: Nakaya nibs are some of my favorite overall (as are Platinum nibs) and this one is my favorite out of all of them. The base nib was a Soft Medium which gives it some lovely springiness and bounce. Then Mottishaw ground it down to a Cursive Italic that gives my small writing wonderful line variation. The nib does have a specific sweet spot though, if you don’t find it (luckily it lines up with how I naturally hold my pen) the nib can feel scratchy. 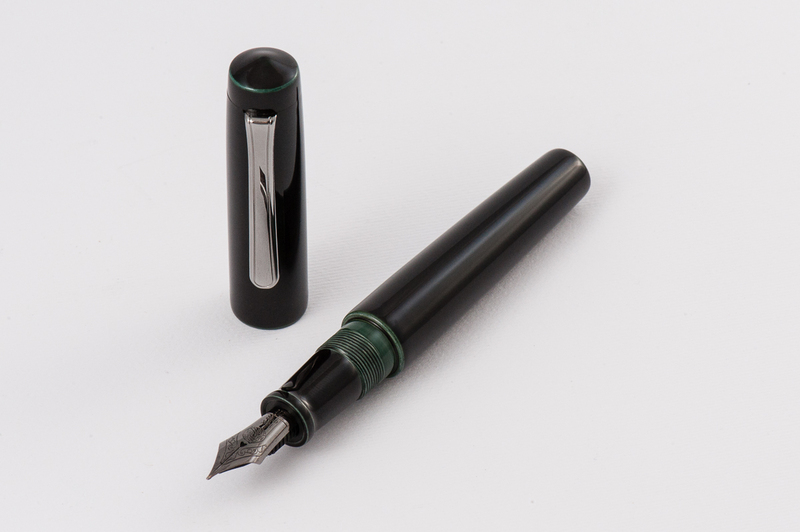 Claire: The first thing I said when I tried Katherine’s pen was that I needed to get a nib like this on my next Nakaya. The Soft Medium CI is amazing. I am a huge fan of soft nibs, not looking for line variation, but the spring in the nib gives a feedback. The CI gives some line variation even when my handwriting isn’t super tiny. 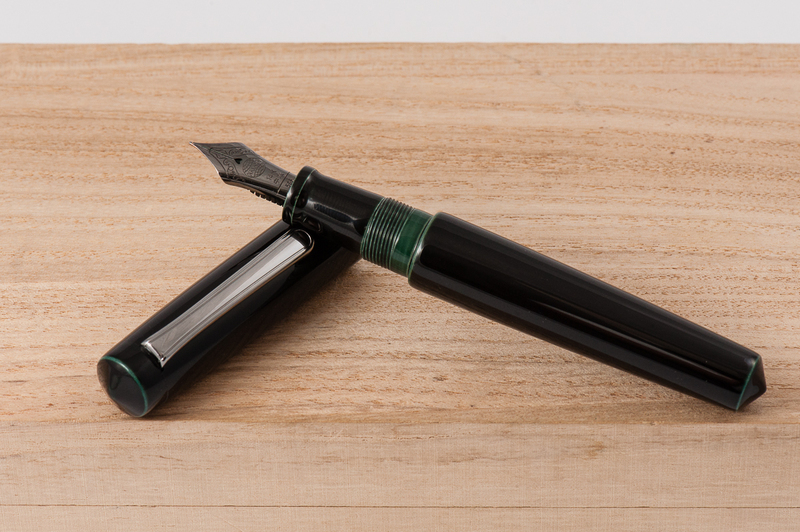 Pam: If I was to purchase a Nakaya, or have another custom pen built, it would have a soft nib from Platinum. 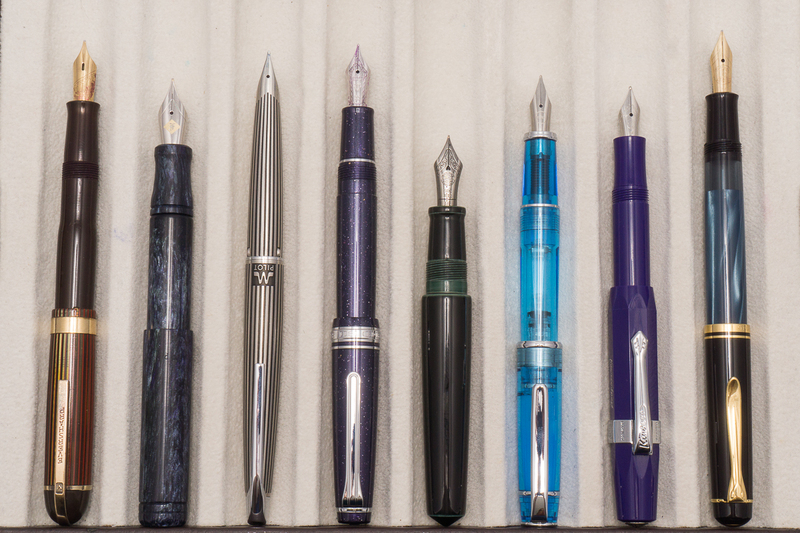 Platinum has done “soft” nibs the right way. 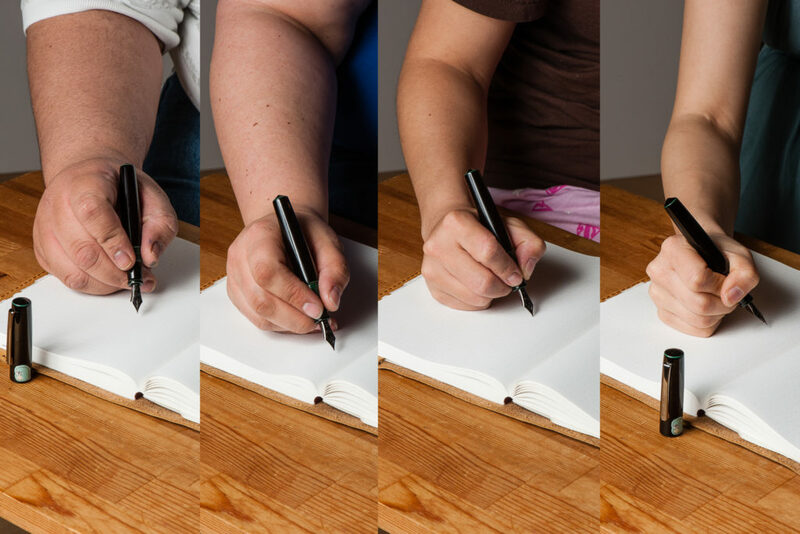 It has a wonderful bounciness and allows for writing variation without straining your hand. However, if you write light enough, you can still get a consistent line. The feed dealt with the extra need for ink with no problems. Adding a CI grind to this nib was a genius decision because it allowed for more versatility and variability in your writing depending on writing pressure. I like a bit of a bite with my CIs and this grind by Mottishaw had a pretty great sweet spot. Of course with a CI I prefer to hold it in a tripod grip but for modeling purposes, my iron grip was photographed. Franz: I have tried Nakaya nibs before especially with John Mottishaw’s cursive italic treatment however, this was my first time to use a “soft” nib and it was pleasant to write with. The bounce of the nib while writing was delightful. It does have a sweet spot because it already is a fine nib and then transformed into a cursive italic. When you’re not writing in the correct angle, the nib will definitely let you know. Trust me, I know. But when you have it in the right angle, it’s perfect! 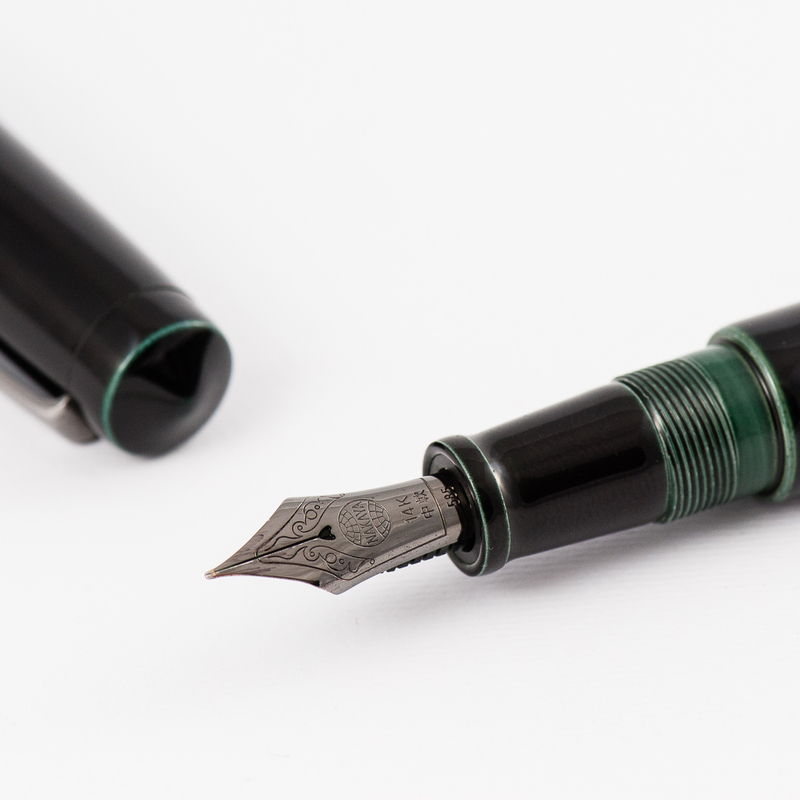 And I believe that that heart-shaped breather hole adds to the love of writing with Nakaya nibs. Katherine: The Piccolo is a perfect size for me. It’s short, which fits my hand wonderfully, but not too narrow. It has the section width of a full size pen (it tapers from 12.25mm to 10.75mm) which makes it comfortable to hold for long periods of time. Claire: My Piccolo is the first pen I reach for when its time to write anything down. I might have burned through a good deal of my finished bottle of Shin Kai with this pen. There are not many pens I can sit down and write with for hours on end. Usually, I tend to switch pens every few pages of writing to keep things interesting. Pam: I did borrow a Piccolo from Katherine and had a hard time returning it. It was a really great pen with such wonderful craftsmanship that can literally be felt as you handle and write with the pen. The threads are not sharp for iron grip purposes and the section is fantastic, so comfortable for the tripod grip. 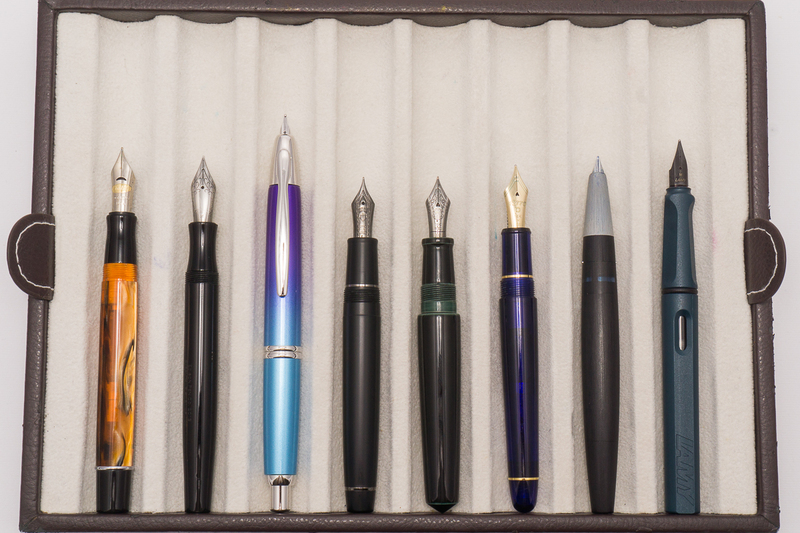 The variation that the nib provides really kept my attention and interest as I wrote with this pen. Franz: Ah yes, the 20-minute writing experience. I gotta say that my hand wasn’t really happy writing with the Piccolo for a long period of time. Actually, after five minutes of writing my hand felt fatigued. I found the section to be a bit narrow so my grip landed on the barrel section and the short length of the pen was not really comfortable for me. I also tried to lower my grip to the section like the ladies above but it just didn’t feel natural for me. 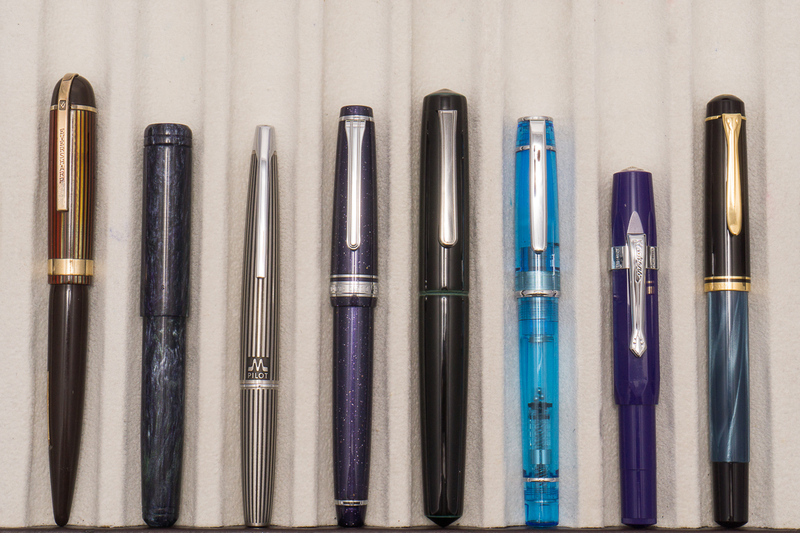 Claire: There are not too many pens in my collection that I would bring with me to work. Though I don’t have a job where fountain pens would be remotely useful. That being said, when I am going to sit down and take notes or journal, this is one of the first pens I reach for. and the reason is just how comfortable it is to write with. This is key especially for long note taking sessions . Pam: Not being the owner of the Piccolo, I kept the pen safe at home. Again, this pen is a work of art and at the risk of sounding pretentious, it should be savored while in use. This pen is best enjoyed in long and slow writing sessions. Franz: The Piccolo’s smaller size qualifies it to be called a pocket pen and definitely is a convenient pen to bring along anywhere. It is also a nice pen to use at my work setting. The nib was fine but smooth for copier paper. When I need to write a quick note or signature, the fast uncapping helps a lot. The clip definitely secured the pen on my shirt pocket during the day. The pen is a cartridge/converter filled so you may find yourself re-inking after 2-3 days if you use it a lot. 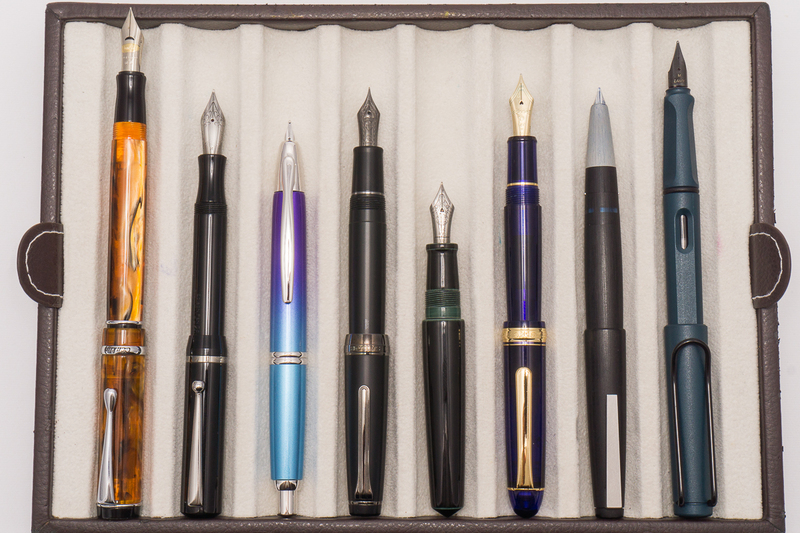 Katherine: If I could only keep one pen and nib, this might be it (please don’t make me though). It’s a fantastic pairing of an excellent (and interesting) nib and a visually interesting body that’s truly a work of art. 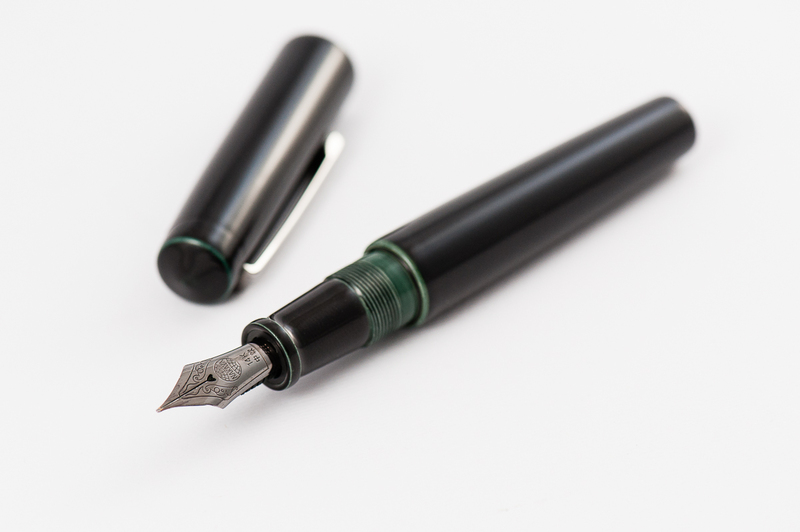 The Piccolo is certainly a short pen, but it’s an unusual combination of shortness without the typical small-pen narrowness — and that fits my hand perfectly. Claire: There are no two ways around it, I love this pen. The size, shape and weight are perfect for long writing sessions, though I wish the converter could hold more ink since I am refilling the pen constantly. I don’t think this could be the only pen I owned for just this reason. The small ink capacity would make it difficult as a daily writer for me since it seems that I rarely run out of ink when I’m home. 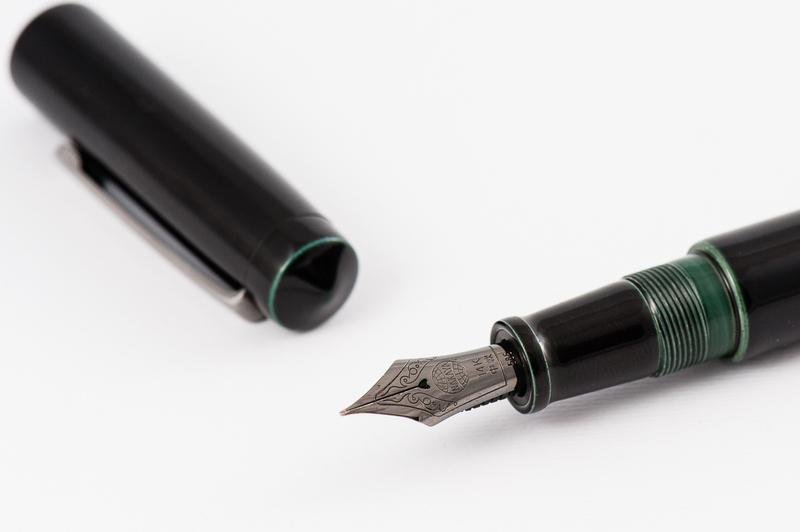 Franz: I like the Nakaya Piccolo for it’s aesthetics and nib performance. But the very reason that the ladies above love this pen is the same reason that I wouldn’t own one. It’s just too darn small for my big hands especially when it comes to journaling or writing letters. To solve this issue is to just post the cap, right? But that isn’t something you do with an urushi laquered pen because it will mar the finish. 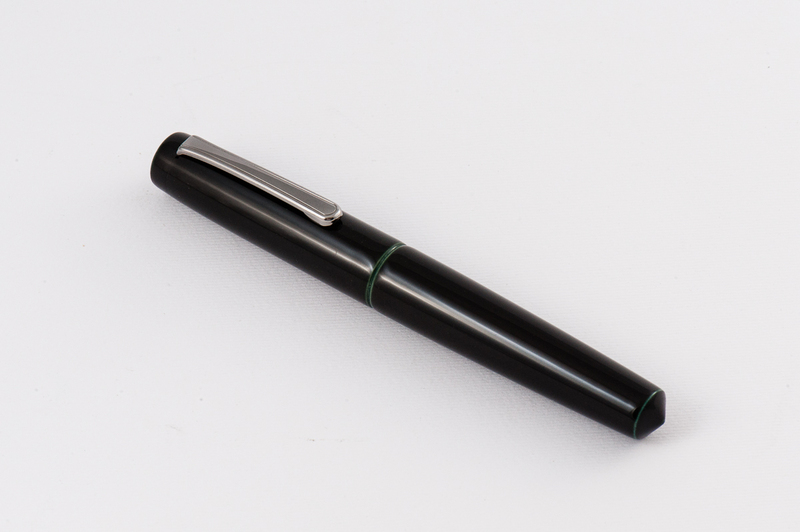 Most people would like to take care of their pen’s appearance especially when it costs something like a Nakaya. Overall, small to average sized hands, try the Piccolo out because you will more than likely want it. For people with larger hands who like the shape, skip the Piccolo and look for either a Long Piccolo or a Naka-Ai. Both are exclusive pens sold by Aesthetic Bay in Singapore. 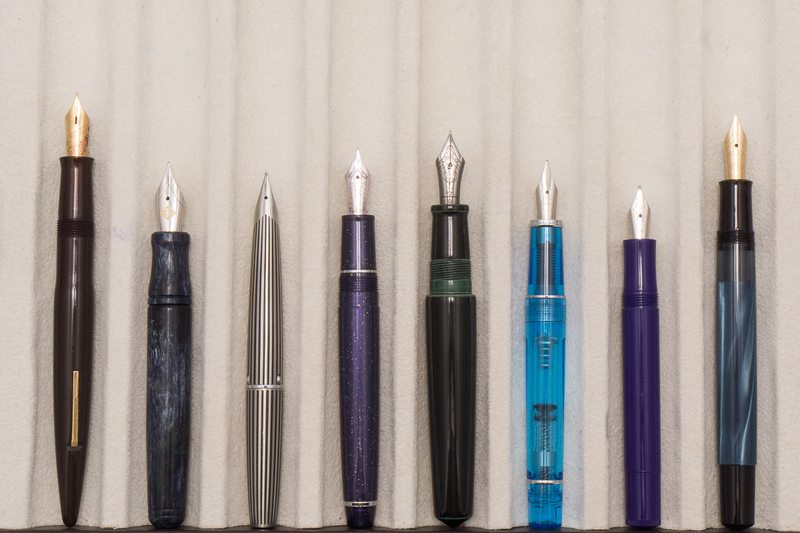 and Classic Fountain Pens, Inc. in California, respectively.